"Look for your inspiration to the victorious lobster, with its 350 million years of practical wisdom," professor and clinical psychologist Jordan Peterson gushes manfully in his best-selling advice book 12 Rules for Life. "Stand up straight, with your shoulders back." If that sounds ridiculous, it is only because it is ridiculous. To state only the most obvious problems, lobsters don't have shoulders. They are creeping arthropods with segmented limbs; they do not look like people, and none of their joints can be reasonably described as shoulders. Lobsters also do not stand up straight; they crawl across the sea bottom. Peterson refers to dominant lobsters as having an "upright and confident posture", but lobsters don't have skeletons, much less postures. "Stand up straight like a lobster" isn't even coherent enough to be bad advice, much less good advice. It's simply nonsense gibberish—and that's before you get to the assertion that contemporary lobsters have been around for 350 million years, which is about as accurate as saying that humans have been around for 100 million years because that's when placental mammals first enter the fossil record. So what does Peterson think he's talking about? Ostensibly, his claim is that lobsters live in hierarchical societies. Low-status lobsters supposedly have different brain chemistry from high-status lobsters, and that different brain chemistry affects their posture. From this, Peterson concludes that human hierarchy is natural, and that if you model your posture on that of a high status lobster, you will change your brain chemistry and be more successful. Shorn of the logical fallacy of scrambling cause and effect (hypothetical shouldered lobsters stand up straight because they are successful, they aren't successful because they stand up straight) the reasoning is the equivalent of arguing that sloth bears eat their children if the children are unhealthy, so human mothers should eat any premature children. The difference of course being that sloth bears are a lot more closely related to us than lobsters. They even have shoulders. I admit I didn't read much of Peterson before deciding he was a crackpot - I took a shortcut: I first heard of Peterson through alt-right Claire Lehmann interviewing him in alt-right Quillette. Actually I saw a tweet by Lehmann chortling over Peterson's idiotic impression of a straw-feminist which linked to the Quillette interview. If Lehmann thought he was clever, I assumed there was something very wrong with him. And there was, as P.Z. Myers soon confirmed in his two videos explaining what was wrong with Peterson's claims about lobsters. But really, although I admire Myers' work and appreciate his generosity in giving his time outside of academia to make videos discussing evolutionary biology topics, with those two lobster videos he kind of brought a bazooka to shoot down a gnat. Peterson is so confused and so far from actual science his bizarro fantasias hardly seem worth the time of an eminent evolutionary biologist to debunk. On the other hand, Myers regularly tangles with creationists, so debunking bizarro fantasias is something he enjoys doing in his spare time. Peterson doesn't care whether he's right or not about the actual biosociology of lobsters, and his followers don't care. They want to strike out at people who are telling them that white men don't necessarily deserve to automatically be at the top of the world's hierarchy and Peterson is happy to give them smart-sounding ammunition. And by smart-sounding I mean in the sense of Tabatha Southey's Is Jordan Peterson the Stupid Man's Smart Person? There are lots of not-very-bright people out there, although thanks to the Dunning Kruger effect they don't believe they are not-very-bright. In fact they often think they are very bright indeed, judging by the attitudes copped by Quillette authors. And so when a hack like Peterson comes along, using STEM terms and complicated charts and telling them that they are the smart ones, the philosopher-kings who get why the Disney movie Frozen is anti-male propaganda, they eat it up. And they just can't understand why these so-called intellectuals and those damn liberals don't recognize Peterson's obvious greatness. The Dunning Kruger poster children don't write exclusively for hacky-tacky man-caves like Quillette. Here is Conor Friedersdorf in The Atlantic asking Why Can't People Hear What Jordan Peterson is Saying? At every turn, she is the one who takes her subject’s words and makes them seem more extreme, or more hostile to women, or more shocking in their implications than Peterson’s remarks themselves support. Almost all of the most inflammatory views that were aired in the interview are ascribed by Newman to Peterson, who then disputes that she has accurately characterized his words. There are moments when Newman seems earnestly confused, and perhaps is. And yet, if it were merely confusion, would she consistently misinterpret him in the more scandalous, less politically correct, more umbrage-stoking direction? It appears that Newman didn't do a good interview, but on the other hand Peterson is a crackpot. 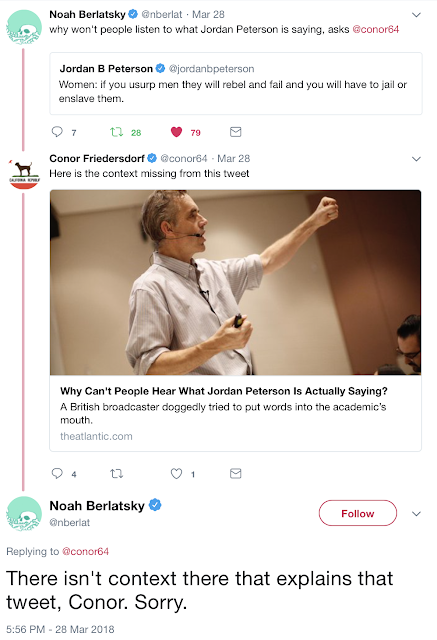 But Peterson's fans, especially at Quillette could not stop talking about Cathy Newman. Not a word about this from those free speech champions at Quillette. But then Quillette and Conor Friedersdorf were the ones telling their readership that Cathy Newman was a big meanie out to be mean for no good reason to Jordan Peterson. Friedersdorf is apparently still not ready to admit there's a problem with Peterson. People can hear what Peterson is saying and as a result think he's an idiot, a charlatan, a crackpot and a hack. The real question - or maybe not so much a question - is why Conor Friedersdorf doesn't get that.